A fire ravaged 13 shacks in Du Noon’s Ekuphumleni informal settlement on Friday evening, leaving three babies and 27 residents homeless and destitute. The residents escaped death or serious injury, but lost all their personal belongings in the blaze believed to have been caused by vutha (witchcraft). However, two dogs were burnt to death in the fire. Residents were puzzled as to how the fire started. The owner of the shack was at Grotte Schuur hospital and owned no electrical appliances, nor was there a paraffin stove left burning. Fire victim Sylvia Myataza, 58, a mother of three adult children broke into tears as she explained that the fire started in her son’s shack, which adjoined hers. Her son is in the hospital, and earlier that evening before going to bed at around 9pm, she had looked in to see if everything was “okay”. But when she returned to her shack to sleep, she heard residents shouting in panic as the shack was burning. The blaze was coming from her hospitalised son’s shack and the flames were licking the walls of her home. She had no time to salvage any of her belongings. “I’m only left with my night gown,” sobbed Myataza, who fainted after the fire was extinguished and saw the magnitude of the damage. Residents had to douse her with water to wake her up, she said. “My two dogs were caught up in the fire and burnt to death,” she said. She was distraught at the loss of her 17-year-old daughter Khule’s grade 11 school books and school uniform. Kuhle is supposed to be writing her grade 11exams shortly. “I don’t know how I’m going to study. I don’t know how it’s going to affect my exams. I hope to make it to grade 12,” said Kuhle, who, like her mom, was also in tears. “It’s so heart breaking. We have to start from a scratch to rebuild our homes,” said another fire victim, Nomthandazo Hlabane, 32, who is a single mother of two children aged 10 and four. She said there was no doubt that the squatter camp was vulnerable to witchcraft. 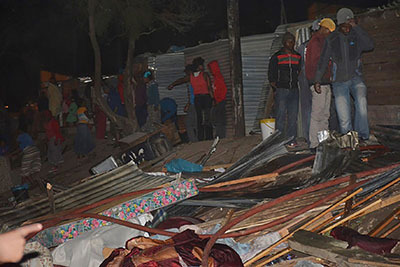 Acting head of city disaster management, Wilfred Solomons-Johannes, confirmed the incident, saying the fire destroyed 13 shacks, leaving twenty-seven “adults and three babies displaced”. Bonteheuwel: At 14:03 on Friday, a fire occurred at 19 Lepelhout Street in Bonteheuwel. The fire destroyed one backyard dwelling, leaving two people displaced. Elsies River: At 14:33 on Friday, a fire occurred at 25 Belera Close in Elsies River. The fire destroyed two-backyard dwellings, leaving nine people displaced. Atlantis: At 20:13 on Friday, a fire occurred at 8 Cuckoo Crescent, Robinvale in Atlantis. The fire destroyed one backyard dwelling, leaving one adult male displaced. Strand: At 23:48 on Friday, a fire occurred at 44 Johaar Adams Street in Strand. The fire destroyed one backyard dwelling, leaving one person displaced. Atlantis: At 21:40 on Friday, a fire occurred at 14029 Hobe Street, Witsand Informal Settlement outside Atlantis. The fire destroyed one shack, leaving two persons displaced. Khayelitsha: At 16:23 on Saturday, a fire occurred at QQ Section squatter camp situated between Lansdowne Road, Nyaphi and Bonga Drive in Khayelitsha. The fire destroyed 17 shacks, leaving 50 persons displaced (including 15 babies). The fire victims were provided with emergency shelter at the OR Tambo Hall overnight. Durbanville: At 00:34 on Sunday a fire occurred at 4 and 6 Seventh Avenue, Fisantekraal outside Durbanville. The fire destroyed five shacks, leaving 27 people displaced. Kraaifontein: At 00:58 on Sunday a fire occurred at 26724 Barker Street, Phase 9, Wallacedene in Kraaifontein. The fire destroyed twelve shacks, leaving nineteen people displaced. Kraaifontein: At 05:11 on Sunday a fire occurred at 23173 Arosi Crescent, Wallacedene in Kraaifontein. The fire destroyed four shacks, leaving fifteen people displaced.